When history repeats itself, often it is because a majority got it wrong and the minority view struggled until its wisdom was recognized. 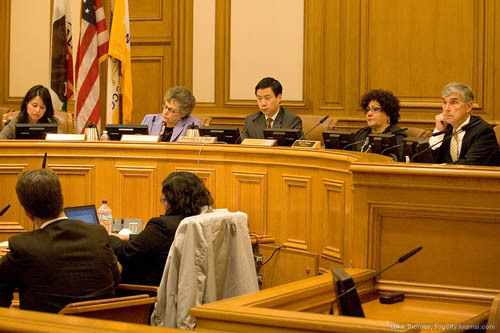 That’s the case with the Ethics Commission and its chair, Ben Hur, who dissented from the majority by voting against a finding of Official Misconduct charges filed against Sheriff Ross Mirkarimi. It was an unprecedented dissent in a Commission that can be counted on to be unanimous in its views. On the U.S. Supreme Court, great dissents get labeled as such. At Ethics, they appear likely to end as road kill as the majority speeds to its intended destination. If there is any doubt about that, one has only to read the just-released “summary statement” that describes the months long Ethics hearings and outcome (read the summary statement here). In its drive to reach the desired conclusion, the summary rewrites rather than reports, even misstating with a claim that the Commission voted to find Mirkarimi guilty of misconduct on two of the six charges. That, of course, is not what happened. Instead the Commission found that all six charges could not be sustained as presented, dropped four immediately on the grounds that they were unproven, and then debated how to handle two remaining charges that also contained allegations the Commission did not want to endorse. In the end, they opted for a report that relied on what they termed the “heart” of two charges, rewriting them to suit and ending any pretense that the mayor’s case had held up in any of its particulars. For Mirkarimi, the end result is the same – the Board is slated to get a report that recommends he be found guilty of misconduct, the mayor boasts inaccurately that the Commission supported his charges, and the commission will move off the front pages. That would end the matter except for Commission Chair Ben Hur’s Great Dissent. Hur returned again and again to themes that led him to dissent n an effort to sway his colleagues. Failure to apply a strict standard, he said, opens the way for an Official Misconduct charge to be used for mischief, denies city officials a clear understanding of the line where an action crosses into official misconduct, and implicitly leaves the public vulnerable to a political rather than a legal standard. “If we do not find a nexus to the relationship of the duty, then we are opening this provision up to abuse and manipulation down the road, in a way we are not really going to like,” argued Hur. “I have grave concerns about what the next case looks like unless we interpret this in a way that I think the voters intended, and is narrow and understandable for elected officials,” continued Hur. It was an unspoken rebuttal to the mayor’s claim that he can decide to file charges on a “case by case basis,” a discretion that is not anchored in any clear statement of limits. It also implicitly urged his colleagues to consider that endorsing a charge of official misconduct under these circumstances would destabilize city government by leaving officials vulnerable with no guidance on the meaning of the charter. Hur offered another potential problem with the majority view that official misconduct could include actions that were not related to the performance of duty and did not take place while in office. “I think we are going to do this mayor, future mayors, and elected officials service if we interpret this in a way that is clear. I have a lot of concerns about where you draw the line if you do not relate it to the duties,” said Hur. Hur noted that the official misconduct removal proceedings are not the only provision that protects the public, hinting that its application should be for very specific purposes while other provisions address broader issues. The official misconduct process, however, provides unique power to the mayor and would result in a disruption, Hur told his colleagues. “I think the voters intended official misconduct to be something narrow because it provides the mayor with a very strong tool that really could disrupt an elected official,” observed Hur. “I think you put the mayor in a tough spot if it is too broad,” explained Hur. “Every time he uses it, he will be accused of using it…because it is so vague, it will always be subject to that challenge, and he may always feel he needs to bring it up, because he does not want to be looked at as letting official misconduct go,” noted Hur. Hur tried one more time to walk his colleagues through his case against a finding of Official Misconduct. “Perhaps I can give one last shot at explaining it,” said Hur. “While I appreciate suggestions that perhaps this could be limited to unlawful conduct, and thereby create some kind of line, that we could import rules that are used in the employment context, I think the only principled way to limit this provision is to have a direct nexus between the wrongful behavior and the relationship to the duties,” he argued. “I do not think it can be limited to unlawful conduct, given the purposeful use of the word “wrongful” rather than “unlawful.” I do not think it can refer to multiple standards when it refers to only one,” Hur outlined. “The conduct, in this particular case, I think was egregious,” Hur stated, making clear his distinction between his view of the law and his view of the issue of Mirkarimi’s behavior. “But, again, I do not think it is our job to determine what his level of efficacy is going to be, going forward,” observed Hur. Hur then said he was imploring his colleagues to join him in voting against a finding of Official Misconduct. “I implore my fellow commissioners to take a narrow and principled view of this clause that will enable those who use it, going forward, to apply it in a consistent way,” stated Hur. Hur did not sway his fellow commissioners but his arguments held a faint echo as his colleagues debated exactly what conclusion they had reached. Commissioner Paul Renne, the newest member, suggested that the Commission might consider the mayor’s action in bringing the charges. “We could address the question of whether or not we think that the mayor exercised his discretion in filing the charges and in proceeding in an unreasonable manner,” said Renne. At that point, the Commissioners turned to what should be included in the document forwarded to the Board. “I guess what I am suggesting is that the written document if we prepare one should be a clear articulation of what the charges were that we found supported and sustained the mayor’s action in suspending,” one commissioner said. While that statement was intentionally nuanced to clarify that all the allegations and facts claimed in those charges were not endorsed by the Commission, by the time the summary document was drafted and made public, the nuance and the critical elements of Hur’s dissent were missing from what the Board would see. So also was any possible discussion of whether the mayor properly exercised his discretion in his handling and argument of the charges. Hur’s dissent failed to win over his colleagues but it may find a more receptive audience at the Board of Supervisors.